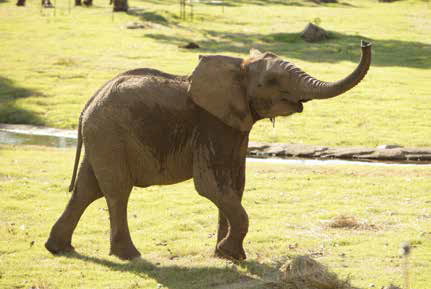 As board president, Mark DeVries helped to bring six new elephants to Kansas. It’s not very often that you get to tell the story of helping to rescue elephants from Africa, but for Mark DeVries, it was years worth of work, patience and perseverance to get there. Today, that story comes with a happy ending and six new residents at the Sedgwick County Zoo in Wichita, KS. “This is a very exciting time,” DeVries says. DeVries is head of the zoo’s board for Wichita’s main attraction, and he has been a big part of significant change over the past few years. But he’s handled the growth well — his career at POET Ethanol Products has helped him to build the endurance. He’s seen a lot of growth there, too. When DeVries was a new employee in 2002, the business was new as well. Time flies, and today, DeVries is the Vice President of Business Development and International Infrastructure and Projects at POET Ethanol Products, an ethanol marketing company in Wichita, KS, that now has over 150 employees. Busy, too, as he balances two important roles for the Wichita community. But he continues to persevere, and it makes for a great story. DeVries has been on the board for the Sedgwick County Zoological Society for 18 years now. He began this endeavor when he was working for Koch Industries back in 1998. He’s been with them ever since. Today, DeVries serves as president of the Zoological Society’s Board of Trustees, leading a group of 35 community members who help to support and operate the zoo. Sedgwick County Zoo has been serving the Wichita, KS, community for over 30 years now and is home to 3,000 animals of nearly 400 species. It’s truly a delightful adventure with exhibits that replicate the natural habitats of the animals, DeVries says. The elephants arrived in Kansas in March on a Boeing 747. DeVries was there the day they landed, and he said it was a very exciting moment. “This was a culmination of five years of intense efforts and planning and work to get them here,” he says. DeVries says work began years ago when the zoo wanted to improve its elephant exhibit. During this time, there was also a change in regulations from the Association of Zoos and Aquariums (AZA). 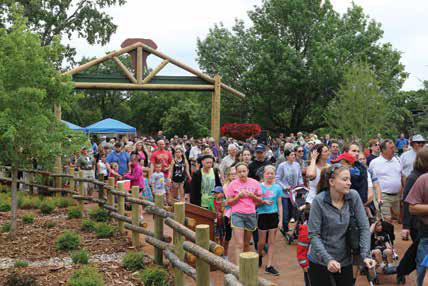 Sedgwick County Zoo is an AZA-accredited park and needed to abide by new guidelines. Their names were Stephanie and Cinda. DeVries says both elephants were older, “some of the oldest in the country,” and it wasn’t long before Cinda died. That left Stephanie alone. So, to avoid sending her to another home, the Sedgwick County Zoo began campaigning for a new exhibit that could accommodate more elephants. It worked. DeVries says a fundraiser for the construction of the new facility raised over $10 million, and the exhibit was completed last year. But that was only half the battle. Stephanie needed fellow residents to join her, and so the search began on how to bring in new companions. They found them in Swaziland, DeVries says, a small monarchy in southeast Africa between South Africa and Mozambique. It was a long, intense process, DeVries says, but not only did it bring six elephants to Sedgwick County, it was a successful rescue mission. Without zoo directors stepping in, those 17 elephants would not have survived. “These elephants were unfortunately slated to be culled,” DeVries says, which is a process that reduces a wild animal population by selective slaughter. DeVries says if those 17 elephants hadn’t been rescued within a month, they would’ve been euthanized. “It’s a tragic situation,” says DeVries. “In many parts of Africa, elephants are being poached and killed at the rate of nearly 100 a day. But Swaziland is very good about protecting their elephants. There is a need to remove some of them, and we were able to step in. The six new residents of Sedgwick County Zoo are setting in well. 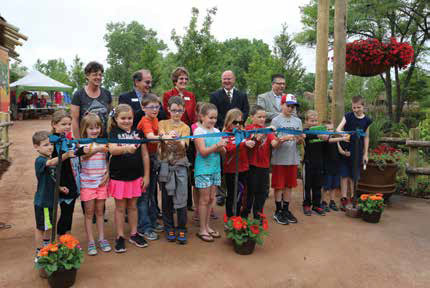 Speaking of their new home, it’s officially called the Elephants of the Zambezi River Valley and is the third largest elephant exhibit in the country, says Melissa Graham, public relations and marketing manager at Sedgwick County Zoo. Their outdoor space spans over 5 acres, and they have 18,000 square feet of indoor space as well. They can roam from four different yards that feature waterfalls, a wading pool and rich vegetation. The exhibit opened to the public over Memorial Day weekend. Even though he says it’s been a challenge at times to juggle so much positive growth for both his work at POET Ethanol Products and at the zoo, his patience and efficient work ethic has paid off, and the Sedgwick County community will benefit from that.